Indeterminate. Regular leaf. 90 days. Mr. Glazebrook holds many records for vegetables including tomatoes. Original seeds come from Michael Johnson who lives in Nottingham England. 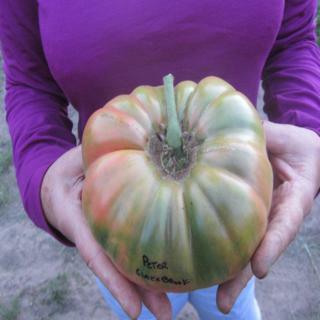 Gigantic pink beefsteaks grow on tall rampant vines with great productivity. Many doubles are common. Fruits have excellent eating qualities and again the genetics to reach record sizes. *Competition tomatoes are six seeds.